I’m off to Cardiff, Wales and Zurich, Switzerland to photograph two client projects. Since I’m over there, I’m fulfilling a long time dream of spending some time in Iceland. 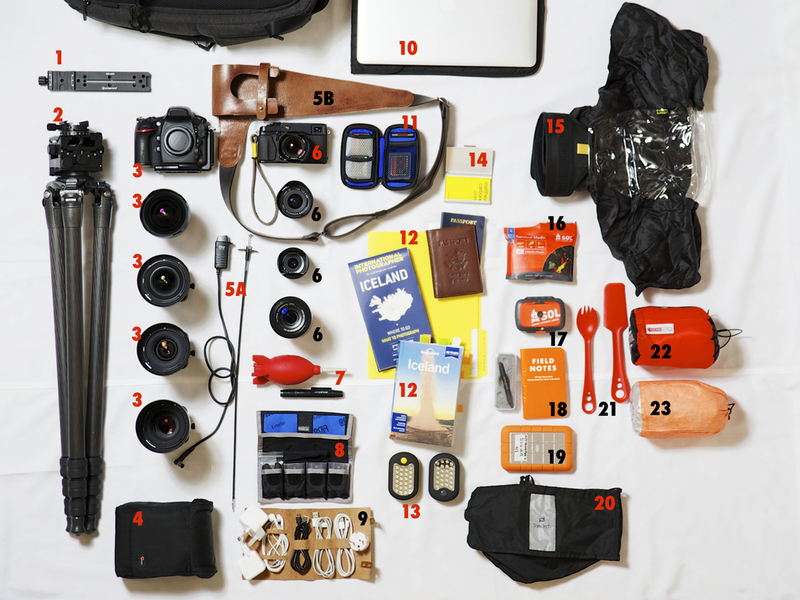 Below is an overview of what photography gear I’ll bringing for my trip. North Face Large Duffel Bag – a huge, durable bag that I’m not scared to beat up. And perhaps you noticed, it’s bright. Easy to spot in a sea of black roller bags at the airport. 1. Arca Swiss Rail. This is a simple tool for making single row panoramas. 2. Gitzo tripod + Arca Swiss Cube. 3. Nikon D800 + Lenses. 14-24mm, 24mm PC, 45mm PC, 85mm PC. 4. Lee Filters. A bunch of neutral density filters for controlling shutter speeds and uneven exposure scenes. 5A. Shutter Triggers. Clearly I screwed up numbering these and realized it later. These are simple shutter triggers. One for Nikon, one for Fuji. 5B. Wotancraft Atelier WWII Camera Holster. Over the last few weeks I’ve been testing out the backpack and found I took drastically fewer photos with the camera starting in the pack. So I got this holster thing. Camera is secured, doesn’t bounce around when hiking, and easily accessible. 6. Fuji X-Pro1 + Lenses. 14mm, 18mm, 35mm, 55-200mm. If I wasn’t shooting two client projects, I might just take this kit. The Fuji is that good and it would be SO MUCH lighter! 7. Rocket blower + lens pen, gotta keep the gear as clean as possible. 8. Camera Batteries. Four batteries for each system. In cold weather, its wise to keep the batteries close to your person otherwise idle, cold batteries will drain quickly. 9. POWER!!! Adapters, cords, etc. 10. MacBook Pro Retina – I’d prefer NOT to take this but I have deadlines, and so its coming along for the ride. 12. Important Documents. Yellow folder contains all my travel arrangements in date order. Passport, that’s important right? Also included is the International Photographer’s map of Iceland. Found this online, really helped with planning of my trip, plus its a great map[I hope]. Lonely Planet’s Iceland book was also helpful. 13. Small LED lights. I’m planning on using these in a variety of ways. Utility, creatively, and for general safety needs. 14. I hope to meet some folks along the way. Business cards for are an easy way to give out my contact info. 15. Camera Raincoat. Big one here. Primarily for the Nikon. Iceland’s weather is insane, and changes rapidly. Having this will allow me to photograph in a few more conditions. 16. SOL Survival Medic kit – it has an SOL Emergency Blanket, fire sparker, tinder, whistle, duct tape, and button compass, as well as antiseptic wipes, gauze, and bandages to patch up cuts and scrapes. 17. SOL Origin Kit. Some overlap in equipment, but good things to have. 18. Field Notes Expedition Edition Note Book + Space Pen. Long time Field Notes user, I’m excited to use the Expedition Edition in a landscape that warrants it. 19. Back Up Hard Drive. 20. Tripod attachment. Iceland is extremely windy. With this thingy, I can attach it in a couple of places and weigh down my setup with my backpack, rocks, perhaps a helpful flock of Puffins. Again, its about being able to make photographs in harsh conditions. 21. Heavy duty plastic spork and knife for those meals on the go. 22. Thermal sleeping bag layer. I’m planning on roughing it a few nights, and while I might make additional arrangements for a proper sleeping bag while in Reykjavik between this and #23 I should be off to a decent start. 23. SOL Escape Bivvy – sleeping bag shell it keeps rain, snow, and wind on the outside – all while reflecting your body heat back for warmth. These items are both really small, light and provide me with some piece of mind before heading over. Some people just have “it” and I think Matthew is one of those people … I look to Matthew’s work for inspiration as I try and develop my own photographic eye. I’d like to thank him for playing along with this series and sending me his images and his descriptions. If you would like to be considered as part of this series, and you have a job that I haven’t already covered (I’m gratefully up to my ears with architects and student bags), I would love to receive an email from you.